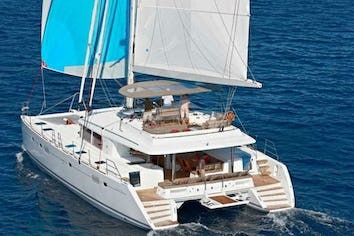 WORLD’S END is a Fountaine Pajot Galathea 65 and a boat to fall in love with. The absolute best-seller in our fleet is not without reason the most requested vessel for repeat customers. Having undergone a total refit in 2016 she looks more beautiful than ever. Its stylish design, decorated with colorful cushions puts you in a playful, though relaxed mood throughout your journey. This sailing yacht catamaran was built to highest industry standards to guarantee your safety and comfort under all circumstances. The moment you set your foot on board, you will be overwhelmed by the luxurious and translucent interior, by the comfortable and spacious cabins, the relaxing atmosphere of the deck areas, the intriguing variety of water toys and most of all the amazing service of the WORLD’S END crew, who will make you feel extravagantly spoiled in every way. Accommodating up to 10 guests, in one King size cabin, three Queen size cabins and one twin cabin, all equipped with private bathroom facilities, it is perfectly suitable for sublime vacations with your family or friends. The aft deck will make you feel like sitting on the private terrace of your summer bungalow, enjoying the tranquility and comfort, either having a deliciously prepared meal, created according to your desires by your Chef with a vast variety of Mediterranean flavors, either simply relaxing and blending in with the amazing environment your Captain will have taken you to. The sailing catamaran WORLD'S END will bring you to the most beautiful places in the Mediterranean while traveling in all comfort and privacy. 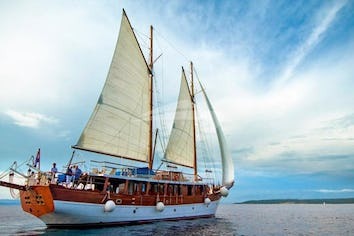 Guided by her crew you will yourself discover the magnificent islands, nature and culture. If you feel like maintaining your daily exercise and to digest the delicious meals, (you probably will gain a few pounds), there are numerous water toys waiting for you, which are going to make you feel like playing in your own amusement park, whether you are being towed on a tube, banana, or water-skis, paddle boarding, wake boarding or having a small trip in the kayaks, or living the ultimate experience of diving with one of the sea-bobs. If you’ve ever used a sea-bob before, you know what it feels like. 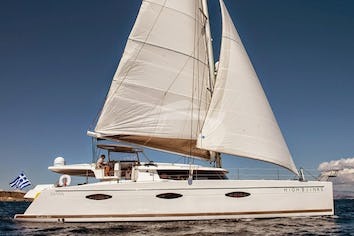 During the hours between meals and playing in the crystal blue waters, you can either relax sunbathing on the comfortable mattresses on all decks, play with the dolphins, who often swim alongside the boats in Greece, or simply and harmoniously savour the dreamlike scenery during a sunset, whilst sipping a cocktail or a glass of champagne on the cosy upper deck. WORLD’S END will take you on a journey that will not easily be forgotten. The itinerary, activities and the menu will be based on your input and preferences to guarantee you and your guests will have a unique experience to cherish long after. Maria, born in 1991, has been working as an English teacher, while she also speaks fluent Spanish and adequate Catalan. She is athletic, being an active female rock-climbing athlete in her local Mountaineering and Climbing Club, has completed a First-Aid Seminar, is a member of the Environmental Group at the University of Macedonia involved in wildlife and environmental preservation, as well as was a volunteer at the Institution for people with disabilities "Action for Something Else ". All in all Maria is a very active and lively person, who is full of live and high spirited. Avery family (Bob, Kelly, Olivia, Loopan, Georgia & Kincad) & Castallarin family (Aleksandra, Stephanie, Francesca & Luca). Wonderful week, we loved every minute. The Durkin family: Of course we could talk endlessly about how amazing this boat has been, but really it’s the people that make any holiday! In our case, this wonderful crew (Dimitri-Dimitra & Maria) have gone above and beyond anything, we could have expected. Everything from the beautiful bays, to the comfort of activities on board, has blown us away and this trip will always have a special place in our hearts. Thank you, our world will be empty without you. On behalf of all these shipmates, Rand, Paula, Joe, Ron, Samery, Jeff, Sean & Bonnie we would like to thank the crew Capt. Dimitris, 2nd mate Maria and great chef Dimitra for their excellent above and beyond the call and duty! May God Bless you and the crew and may you have many more happy endings. Una settimama di relax e di merazavigliose isole, su uma gram bella barca (fontamentali I SEABOB) com un equipaggio simpatico e professionale, che rimazza mei mostri piu bei ricordi. A Dimitri, Dimitra & Maria. Dearest Makis, Zeta, and Irish words cannot express our gratitude, our thankfulness that we connected with you. The first day was a cordial Hello, not knowing what the next 5 days would unfold. SURPRISE. The families could not have imagined that one would fall in love with the three of you!! Sharing family stories, laughing, eating, toasting what a gift!! Kelly, John, Bruce, and Kathy wish you safe sails. Thanks to the best crew of the (Worlds End)! Dear Makis, Zeta, and IrisYou are a fabulous crew. We have enjoyed every minute on Worlds End. Many thanks from the Aussie Crew And thanks for adding an extra dimension to our charades. Next time we will have a go at them in Greek! Dear King, Zeta and IrisOur voyage was fantastic. We could not have asked for a better crew to be with for ten days. You made everything special and perfect. The King made sailing the Worlds End look easy & fun. Zeta & Iris worked very hard to make him look good. Stavros, dawn, Greg, Kathy, Katarina, Haley, Mark, Marie & John until next time! Dear Makis, Zeta, and Irish thank you for the trip of a lifetime. The Memories and Experiences shared on this boat will be in our hearts and minds forever. None of this would have been possible without you. You work with a grace and professionalism we have never seen before.Thank you for making us feel at home. What a terrific 3 weeks! We even sailed a little! Fabulous meals and very attentive service. Thank you for giving my guests and me such a pleasurable trip. If in Toronto come for a sail. We can’t thank you enough for all you did to make our stay on board “World’sEnd” so special! Your attention to every detail, effortless seamanship, wonderful cuisine – will be one of our very special memories. Fair winds and seas to you all. Many many thanks for a great trip and for looking after us so well (EspeciallyD – not easy). Lovely food, good sailing and all very comfortable. Thank you for a fantastic trip! It never rains in Greece. We will remember this! Great food, great crew, and great friends. Hope to see you soon! Ps: Zeta, it snows in Belgium! We spent a fantastic holiday on board of World¢s End. It has been an amazing cruise both relaxing as well as full of joy and happiness. We loved the islands of Dodekannese, we enjoyed the waters of the Aegean and most of all, we will remember the great time we spent together. Thank you, captain Makis for finding always the best spots and for leading the boat with perfect professionalism! Thank you, Zeta for your smile and the great food! Thank you, Alex, for being always so kind and at hand when needed! Thank you all for the consistent positive attitude and good humor, for being always protective, professional and simply perfect. Let¢s keep in touch. We look forward to the next cruise together. We were a group of five couples from Florianopolis, south of Brazil. We stayed here for a week and we had a wonderful time here! The cruise and the crew were fantastic! Hope we see them again! We are very grateful for this wonderful boat trip. So happy to have spent 10 fantastic days in the World¢s End with this amazing crew. The coziness of Yeydra, the lovely village of Syros, the toughness of Kea, all the natural bays we had on dinners on the board… it was just fantastic. We hope to come back on another occasion to see more of the Cyclades islands, too much wind now…. but…. a good excuse to come back. Thank you, Alex, for taking care of us as if we were at home. Thank you, Zeta for the amazing dishes!! Thank you, captain, for the nice itinerary and the time you spent with the kids. We will remember the friendliness of the crew and the patience! Thank you for a very memorable vacation. Not only was this 4-day voyage over our honeymoon trip but also accommodated our 4 year anniversary. The trip not only exceeded our expectations but will give us a unique memory to forever look back on especially since we have never experienced a charter like this. We will look forward to our next voyage and only hope to have an experience the same quality of this experience. You are a very lovely crew. Thank you for the hospitality. We had an amazing time. We will never forget this trip and are looking forward to coming again. Worlds end was everything we had hoped for and more! Beautifully detailed dry and sailed well in all winds. We were out at 35 knots + and she handled it like it was what she was designed for! A great amount of space for all of us including bloke my size! But the crew made it that extra special Markis, Nicko, and Zetta ( did I spell them right ? ) We're fantastic And such a pleasure to spend time with Sadly for Markis, I never left the wheel , so he did not get too much downtime Great weather Great fun I will plan a return one day ! Same crew new boat plus Nikos. What a holiday you gave us all. We loved World's End from Crete to Cyclades Islands and have so many happy memories particularly when “ PinkFloyd” were playing. The seabob won the best new toy of the year and the skiing was great. Thank you all for next year! A huge thank you to you for as ever, arranging everything so efficiently and charmingly. The boat as you told us is fabulous, a big step up from Anassa. We love her and managed some good sails, she is so swift, I would have been happy to stay in my cabin in luxury but the lure of Zetas cooking was too much to resist. She really surpassed herself with the most delicious meals which I am now regretting as have had to double my sessions at the gym! What a crew, we are sooooo lucky to have had them again. Mikey and Zeta are totally charming, nothing is too much trouble and all done with a smile and with such good grace. Nikos is a good addition and was utterly helpful and fun. They all work so hard and we really appreciate their kindness and for being such great sports with us all. Please pass on our thanks to them once again. It was a great route, as we experienced a variety of islands and some beautiful towns. The children adored the whole trip from cocktails and dancing to endless fun on the paddle board and sub - I even managed that and it takes a lot for me to get my hair wet!! No comment, no complaints only congratulations and thanks. This month of July was paradise for my peers and myself. Thank you so very much "wonderful crew" we had a lovely time and we were spoiled as ever before. Thank you so much for giving our families a vacation of a lifetime. I must admit having 7 kids on a boat for a week was a little concerning but each of you did a superb job of keeping them happy. Zeta your culinary skills were put to the test and you made each of them happy. From crepes, pizza, smoothies, and meals everything was great. Maki and Nikos you were great with all the water toys – especially teaching them how to ski. The last night was the best with a perfect local fresh dinner followed with great wine and beautiful sunset. You showed us the beautiful Greek islands but even more, you showed us how warm and generous the people of Greece truly are. It was a great week! Our crew was the best and we look forward to coming back soon! This was my 7th time on World’s End and it was the BEST week! The ship was in perfect shape. Better than ever before. Thank you for taking such good care of sea, World’s End and especially us! See you next time! Comfort, cleanliness, service, fun, expertise, all described with the word phenomenal. "This crew made the trip everything that it was. Renee was an excellent chef and worked diligently to accommodate all of our requests and tastes." J. W.
Great job!! It was a wonderful trip!!! Beautiful boat, great captain, amazing chef and the first mate was wonderful, too!!! We had a great week of resting, reading and looking at wonderful beaches. Food was excellent, the boat was pristine and the captain was good at navigating smooth waters.